Dinner by Heston is situated inside The Mandarin Oriental Hotel overlooking Hyde Park in the Knightsbridge area of London. This is one of the most beautiful hotel's I have ever seen. Upon entering you are greeted by three friendly doorman who are happy to direct you to the restaurant areas. 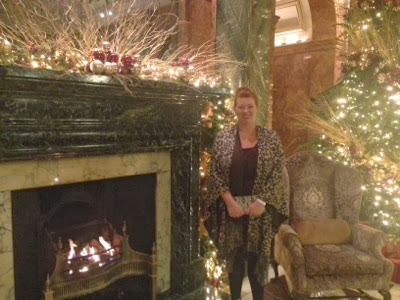 The hotel reception area had been decorated for Christmas. The fireplace was picture perfect! We arrived at Dinner's reception area and we were taken through the restaurant to our table. The restaurant can seat 140 diners so is a lot larger than what you may expect of somewhere with 2 michellin stars. It is interestingly decorated though and split into areas so it still has an intimate feel. We were seated by the window with wonderful views over Hyde Park. 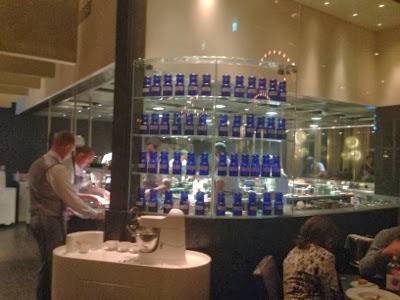 As we were walking to our table our host pointed out the kitchen area which is all open behind glass for diner's to watch and we passed a table which was in the middle of having ice-cream made for them using liquid nitrogen at their table. Very Heston and very exciting! Open kitchen in the middle of he restaurant. 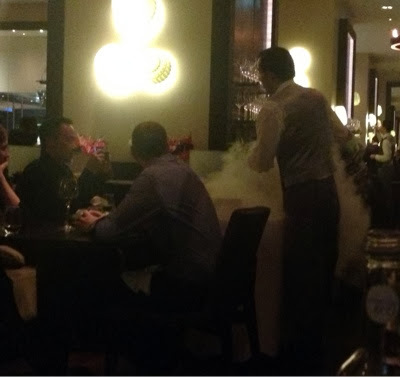 Ice cream prepared at your table using liquid nitrogen. We were offered an aperitif and our menu straight away. When you visit somewhere like here it is very hard to decide what to order as you are only probably going to visit once in your life! We usually opt for the tasting menu so we can sample the best of what the chef has to offer but unusually there wasn't one on offer here and everything is a la carte. I already knew what Heston's signature dishes were and my husband was happy to order these. I really needed some guidance though and our waitress was happy to advise. Next the sommelier approached with the wine menu. It was huge! It's fair to say most were out if our price range so we opted for a bottle of house red which was £35. We weren't frowned upon for doing this and still received personal service from the wine team throughout the evening. I found it interesting that your wine wasn't kept at your table but instead at a wine station where the Sommelier was based. 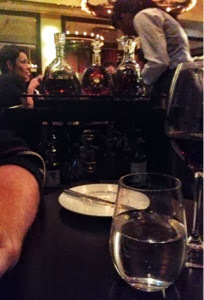 The service was very attentive though and our glasses were topped up throughout the evening. We were brought some white and brown soda bread to start which was pretty boring to be honest. 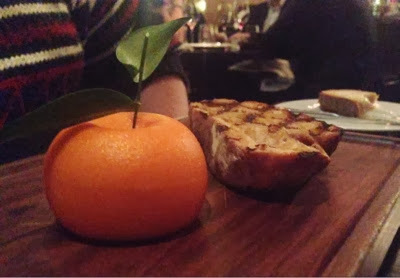 Designed to look like a mandarin the whole dish is edible. 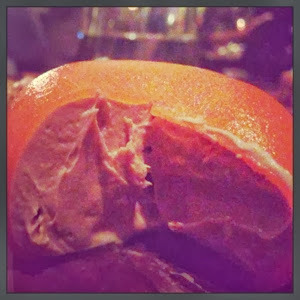 When you cut the fruit open it is filled with the most gorgeously smooth fois grad parfait. I was pleased we still had some bread on our table as it allowed me to dig in too. I opted for the Roast Scallops (c.1820) to start. 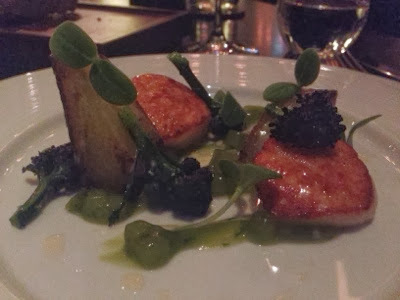 I ordered this dish as I love scallops but they always seem to be served the same way - with pea purée, bacon and black pudding. I was very interested to see how scallops worked with cucumber and I'm pleased to say it worked very well. I've asked hubby to try and recreate cucumber ketchup next time he cooks us a special meal. Let's see how he gets on! 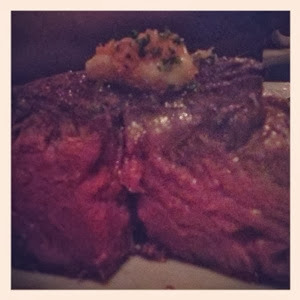 We were asked how we would like the steak cooked (medium-rare) and it was absolutely perfect. In fact it was the star dish of the whole evening. There was lots of it so again I was able to steal a few bites. I'm usually not keen on mushrooms but the mushroom ketchup was AMAZING. It had the same sweetness of regular ketchup but a completely different flavour. 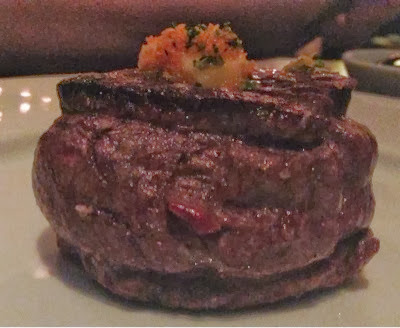 It complimented the steak perfectly though. 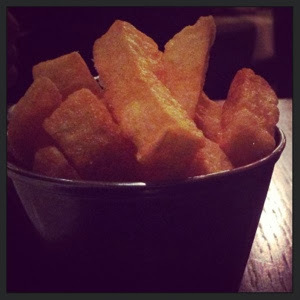 Heston's famous thrice cooked chips also lived up to their reputation and the whole dish was brought together with a fabulous beefy sauce. I could not decide what to order as a main course. 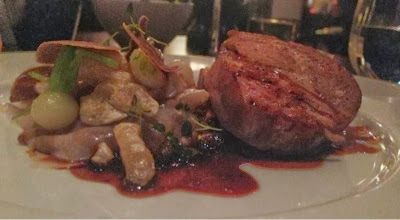 The waitress suggested 18 hour slow cooked pork collar with dehydrated crispy pork skin and white truffle. I would not normally order this dish as it was served with spelt, onions and turnip which are not usually my preferred ingredients. I loved it though! I honestly think Heston can make anything taste great. For dessert, hubby ordered tipsy cake. This needed to be pre-ordered at the beginning of your meal as the brioche that is used in the dish is freshly made to order. This dish was my husband's favourite part of the meal. Again, it isn't something he would normally order. I decided to choose the chocolate bar. This dessert is the richest dessert I have ever eaten. 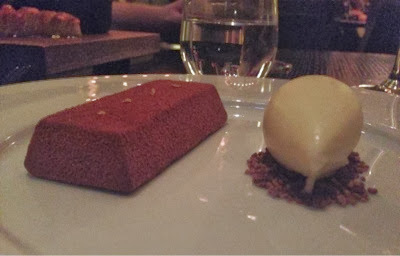 The chocolate bar was like a truffle inside all unctuous and smooth. Absolutely amazing! We were then offered a post-dessert shot of earl grey infused chocolate ganache with carroway seed biscuit. This was lovely but after my very chocolately dessert didn't really add anything to my meal. Hubby however loved his. We were asked if we'd like to try one of the ice creams that we had witnessed being made around the room. It would have been a lovely piece of theatre to end the evening however neither of us love ice-cream so it felt like we would have just been having it for the sake of it therefore we declined. It was rather amusing looking around and watching people eating ice cream cornets at the end of their meal in a michellin starred restaurant. We had a little glimpse into how the other half live when the table next to us decided to take a look at the whiskey trolley! I have never seen such a thing and god knows how much a measure would cost. It was fun to watch the expert talk the table through them all. So, our final bill was £210 for two including wine and service charge. This might seem expensive but for a 2 star Michellin restaurant it's really not. It worked out about 1/5 of the cost it would have if we'd dined at The Fat Duck and we would have spent at least £100 if we'd enjoyed a 3 course meal plus wine in a regular London restaurant anyway. We thought it was fantastic value. Dinner by Heston Blumenthal also offers a fantastic value lunch menu which is only £38 for 3 courses! Sample Menu. £38 for three courses. Available Monday to Friday between 12:00pm-2:30pm. 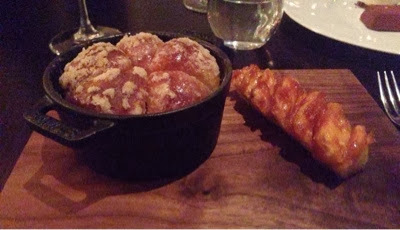 As huge fan's we are so pleased we have now tried some of Heston's food. Dinner was very friendly, modern and not stuffy at all. The perfect place for a London treat.